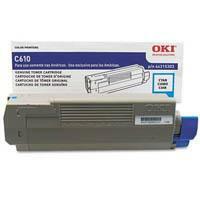 TONER OKIDATA CIAN PARA LA IMPRESORA C610 DE 6000 IMPRESIONES COBERTURA DEL 5 DE IMPRESION. LOS CONSUMIBLES OKIDATA CUENTAN CON GRAN CALIDAD EN SUS TERMINADOS. ESTO DEBIDO A LA TECNOLOGIA HD CON LA QUE CUENTAN.